Send a text to this number to get a FREE Rimmel eyeliner! If you’d like to get a free Rimmel eyeliner just text message the word Rimmel to the number 89000. They will text you a link with a form to fill out your name and address. Fill it out and click submit. 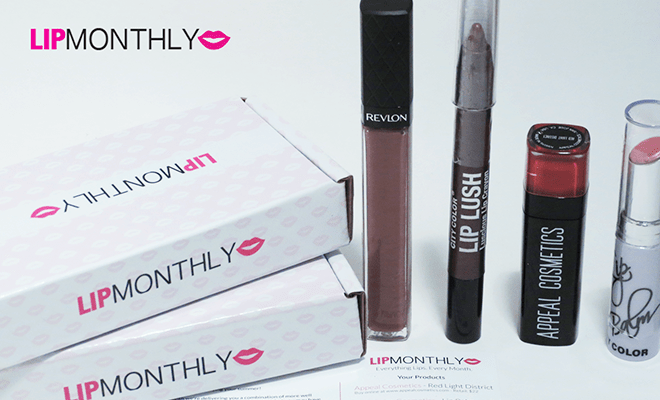 Right now you can score Lip Monthly for only $5 ! Got my Julep Make Up in the mail today! I took advantage of the 50% off sale Julep was offering a couple of weeks ago and my package just came in. I didn’t get my actual Julep Subscription box in the mail yet but when I do I’ll post it to let you know what came in the box. Even thought the 50% sale is over you can still take advantage of the Coveted Nail Polish Kit totally FREE ($89 value) by using the code: FREEFALL and you can take advantage of the Julep 3-pc Holiday Welcome Box FREE (Limited Time Offer). Also, I’d like to point out that with each order you’ll get a 50% off coupon code to use for your next order which is really cool! I can’t wait to get my actual Julep Maven Box in the mail too! I also scored their Coveted Nail Polish kit ($89 value) totally free with a coupon code I had! I also ordered the lip stick you see shown below. Get 2 free Burch Boxes! Last Day! Today is the last day for this offer (Dec 15, 2016) but if you order a Birch Box normally you get your first one free but today you can score TWO boxes free. Sign up for a free account on this rebate site and you’ll get money back. CLICK HERE. You can score TWO free boxes! This is a subscription service so you do have to remember to cancel so mark your calendar if you do want to cancel but I still thought it was worth listing. I’m not affiliated with the Birch Box company but it’s a really nice freebie to take advantage of! Their subscriptions are only $10 so even if you keep it your not putting out a big investment. CLICK HERE to get your two free boxes! Enter to Win Smashbox Light It Up Lipstick + Mattifier Set Giveaway! Hurry and enter because this sweepstakes ends NOVEMBER 30th at midnight MST! These lipsticks are famous for their quality and vibrancy. They are specially formulated to soften and condition your lips, thanks to high vitamin C, E and shea butter content. Each lipstick has a lush and creamy finish. The shades range from bold brights, to classy neutrals, giving you a shade for every occasion. The Lipstick Transformer is so much fun. It’s a cool new product that will convert the cream finish of any of these lipsticks into a velvety, matte finish. With the mattifier, you’ll get two different looks with all six lipsticks in this collection, giving you 12 looks to try. CLICK HERE TO ENTER. Who doesn’t love beauty samples and the best part is it’s totally “free”!! CLICK HERE to get your free Lancome Teint Idole Ultra 24H sample! Hurry while supplies last! Review Peel Off Lip Stain Long Lasting Waterproof Lip Gloss – All The Rage in Japan So I had To Try it! I kept seeing this advertised in my Facebook News feed as a sponsored, all over YouTube and other places, so finally, I gave in an had to try it for myself! This stuff seems to have taken Japan by storm and now it’s making it’s was to the U.S. Well, personally I’m not terribly impressed with this product. Maybe it just takes getting use to with applying and I didn’t find it lasted 10 hours. I’d rate it for more teenagers because it’s along the lines of something you’d find at the local drug store. I’ve tried it a few times now, it’s very messy and thick. I recommend using a lip brush to apply it because if it applies crooked that’s the way it’s going to stain your lips! Use caution applying it because if it get s on your cheek, fingers or hands it’s staining those too!! So be careful! Another thing I’d like to point out is that it took a month for me to get my order in the mail because it was mailed using China Post. I had no idea when I ordered it from Amazon that it was actually shipping from China. I did a bit of online research into this lip stain and found out that if you don’t want to keep it on the whole 10 hours that you can simply use any oil based make up remover and swipe it off. Well, I tried that this morning and it didn’t work well at all. My fingers are still stained. Now that I got all of that out of the way I’ll move on to explaining how to apply it. Like I said before I highly recommend using a lip brush, pick up a nice size bead/ball of it on the tip of the brush and carefully paint it on your lips by outlining your lips with it first. Be sure to apply it thick. The thicker the better because you’ll get more of an even color. What will happen if you apply it to thin is that it will be harder for it to stain your lips evenly and it won’t peel up well at all! Personally I don’t think you need to leave it on your lips an entire 10 mins to dry. I’ve tried both ways but in my opinion you can you tissue starting from the outer part of your lips moving in to remove it before it’s totally dry. I don’t personally always have 10 full minutes to stand in the mirror with my mouth open. That’s why I use the tissue (because it’s only about 80% dry most of the times) when I remove it. The only advantage to leaving it on the full 10 minutes is that you’ll get a deeper darker shade. Once you peel it off check your teeth for any residue and give your finders a look to see if you need to wash them to try to remove any stain. If you did get stain on your fingers or hands try an oil based make up remover to remove it and hope for the best. Once you’ve applied it and peeled the dried layer off simply apply any lip gloss, Chap Stick, etc. of your choice. Also, I’d like to point out I did NOT get this as a free sample in the mail for review. I saw it, wanted to try it, so I bought it. If you’d like to order some you can find it on Amazon here for ONLY $3.95 (select “same size” for the size option!!) for all 6 colors with free shipping but fair warning, expect to wait a month to get it in the mail. The other options cost more for the same thing. Don’t know if it’s a mistake on the sellers part or what but it’s ringing up for only $3.95 and other sellers are selling the same exact thing for over $20! These are pretty nice but don’t expect them to be high quality like your purchase from a dept store with real horse hair or something. These are nice brushes that are made with synthetic fibers. They apply makeup well and I’d describe it as the “smart choice”. Perfect for someone on a budget, a teenager, your first set of brushes. Etc. they come with a gorgeous carrying case! You simply place the brushes inside of the case and set the lead on time. It has a magnetic closure so it practically closes itself when you put the two pieces together. APPLY MAKEUP LIKE A PRO. Create natural everyday looks, radiant smokey eyes to chic red carpet ready. Brushes are handmade with high quality hypoallergenic, antibacterial, synthetic fibers, so they’re always safe & gentle on your skin. The brushes feature dense, soft bristles that feels amazing on your face. VEGAN, 100% CRUELTY FREE AND NEVER TESTED ON ANIMALS – The use of vegan bristles ensures that no animals are harmed during the manufacturing of the brushes. When compared to brushes made with animal hair, vegan brushes shed less, if at all, repel dirt and bacteria more effectively, non porous, and are easier to clean and work well with cream, mineral and pressed and loose powder products. TOP MAKEUP BRUSH ESSENTIALS TO ADD TO YOUR COLLECTION – All brushes were designed and handpicked to provide all-over makeup application with ease. Your set includes powder brush, stippling brush, foundation brush, concealer brush, contour and blush brush, angled eyeshadow brush, blending brush, eyebrow brush, accent brush, eyeliner brush. Each individual brush is labeled. ELEGANT MAKEUP CASE – The brushes come in a designer luxury case with magnetic closure, perfect for travel and storage. Both the top and bottom can be used as makeup holders and is very attractive on any countertop or vanity. PURCHASE WITH CONFIDENCE WITH OUR MONEY-BACK GUARANTEE: We are committed to providing you premium high quality makeup brushes. If for any reason you are unhappy with your purchase, contact our customer care team and receive a full no-hassle refund. If your interested in purchasing a set of these brushes you can find them HERE for only $49.97 ! Sample provided for review purposes. I truly love microcurrent and I’m going to tell you why! I’ve been using the 7e MyoLift Microcurrent Machine for about 8 weeks now and the results are amazing so I wanted to take the time to share my experience and post my own personal review! Being a full time Mommy it took me a while to find the time to be able to actually sit down and wright this blog review but here it is! I must confess, I was actually going to look into plastic surgery for the wrinkles that were developing around my eyes and the hooded eye lids I was beginning to develop but decided to try microcurrent first so see what kind of results I could achieve with that first. I’m honestly so excited with my results I’m going to skip the consult with the plastic surgeon! My face has more of a “toned” look to it now, my skin is much tighter and firmer! My eyebrows appear raised and my eyes have more of an open awake look. The issue with the hooded eyelids I was developing all but went away and so did the crow’s feet around my eyes! I feel I almost have the appearance of Botox without the dreaded “frozen” look! To fit the MyoLift into my schedule I use it when I’m doing my morning cardio walking on the treadmill while my baby is playing with her toys. You can also use it while your watching t.v. at night. The unit is cordless so you can just set it next to you on the couch. You do need two hands to use it though. Because the probes are so small you can easily get around your eyes and lips unlike with the NuFace where you have to purchase an expensive attachment to go along with an already pricy unit. The beauty with microcurrent is that it enables you to be able to “work out” the facial muscles. I mean, let’s face it, we all know how important it is to work out our bodies so why do we skip the facial muscles??! Well, before we never had a way to work out those muscles until now! With age the facial muscles get soft and begin to sag the same as your triceps would. Not good! In addition to working out the facial muscles and keeping your face toned microcurrent actually stimulates new collagen growth. Collagen is something else we unfortunately lose with age. By re-growing collagen it re-plumps the fine lines smoothing them out again and softens deep wrinkles! Think of collagen as the fillers people pay to have injected in their faces for cosmetic reasons but doing it this way is 100% natural! Many professional estheticians on YouTube also highly recommend this machine, which was what helped me decide to purchase it. This is the exact same unit many estheticians use on you when you book a treatment with them. Another huge plus about the 7e MyoLift is the price point and the fact that it’s a professional grade microcurrent unit! Being priced at only $269 the average house mom can actually afford it without stressing over the cost! For comparison sake, if you were to go to a doctor’s office and schedule a microcurrent apt you’d spend close to $100 on one session. Going off those kinds of numbers this unit pays for itself after just 2 treatments!! Just what does “professional” mean any way? It means this unit is meets the requirements to be used in a professional setting (such as by a professional esthetician in a salon selling sessions/treatments) but has been determined safe for home use also. So there you have it! Now you know why I always shop for “professional grade” when I’m in the market for a beauty device. For more information please visit the 7e Wellness website HERE. You can also find the MyoLift on Amazon HERE. I did not get a discount or free unit in exchange for this review. I just love it so much and I’m so excited with my results I wanted to share.